Prices are listed as per actual retail price with major copy centers such as Staples/Kinko's on larger quantities. Cost of Shipping is based on current postal fees with the USPS and the weight of the card stock. Prices for smaller quantities cover costs for printing and supplies for the Maximillian. All prices are rounded up from the half dollar to the next dollar or down respectively. Any additional funds or proceeds go to the Maximillian's charity fund, currently Juvenile Diabetes Fund, JDF. All transactions will be recorded and archived within the Maximillian's Treasury. For any additional questions or info please contact the webmaster. 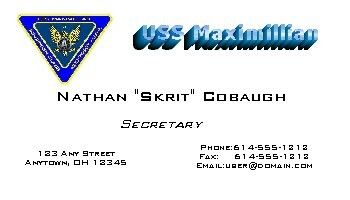 This is the design for the Business cards for the Max, you may order these if you are a crew member. Please contact skrit@skritweb.com for ordering.